@alpinegreenneon - As promised in the "What did you do to your Dart today?" thread, here are my pictures of the leaks. First, the driver's side. This picture was taken from the driver's side facing toward the passenger side front wheel. The black cylinder with the liquid drops on it is a hydraulic actuator, presumably for the DDCT. To the right of it I believe is the DDCT itself covered in cooked-on badness. It's hard to see, because it was 10pm and I was using a portable LED worklight, which made for harsh shadows, but you can sort of see that it's all grimy on the back side of and above the assembly the actuator is attached to. It's hard to see up past it. I am wondering if it's the DDCT hydraulic tank that is leaking (I don't have a picture, but the top of the tank is grimy), although it doesn't appear to be low on fluid. Second, the passenger side. This was taken looking pretty much straight up, and in the foreground is the OEM hot side intercooler pipe. Above it is some sort of metal assembly that oil is dripping from. 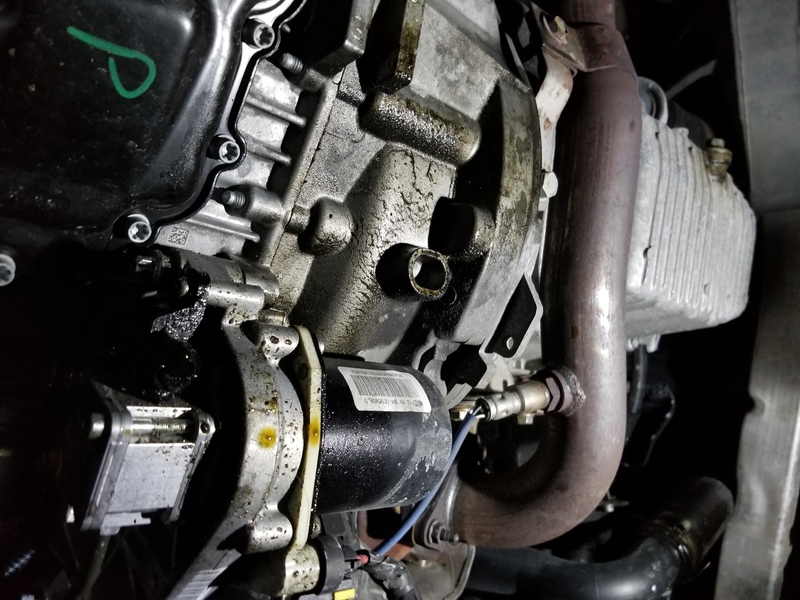 I believe the oil filter tube (the 1.4T has a "cartridge" style filter that clips into a plastic cap that screws into a plastic tube and is accessed from the top) is directly above there. 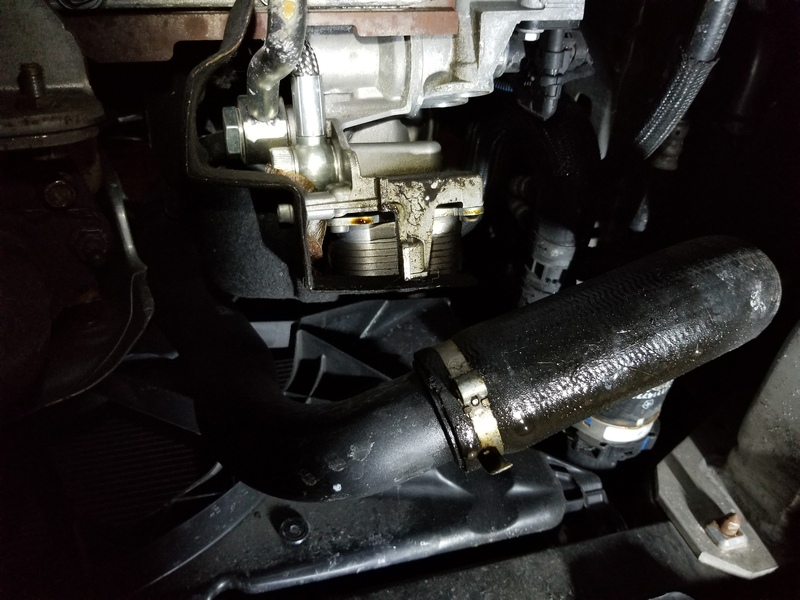 And if this isn't all annoying enough, I now know 100% for certain that the spark plug tube for cylinder #1 (I think, the one closest to the driver's side) is leaking oil. Oh, and two of the yellow clips locking the power harnesses to the coil packs basically fell apart due to becoming brittle. Can these be replaced? The one for #1 is still clipping in somehow, but the one for #4 is basically zip-tied to the oil cap tube. Darts sure don't seem to age very well. When oil leaks are cooked and grimy, you might want to consider cleaning the grime and then once it's clean, watch it carefully every day to see if you can isolate the source. My favorite engine cleaner is Gunk Shiny Brite. 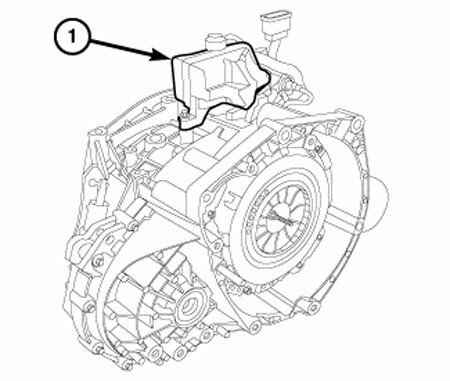 You spray it generously on a warm engine or trans, let it sit for a few minutes and then hose it off. Be careful with electrical connectors, don't want to create problems. Finish with brake cleaner on a rag until you see bare metal. On your trans, I suspect the hydraulic fluid reservoir. I have read a few threads about that. There is a o-ring that could have failed. On the engine side, first replace the valve cover gasket oil tube seals. You know it leaks into a spark plug tube and that will eventually cause a misfire. 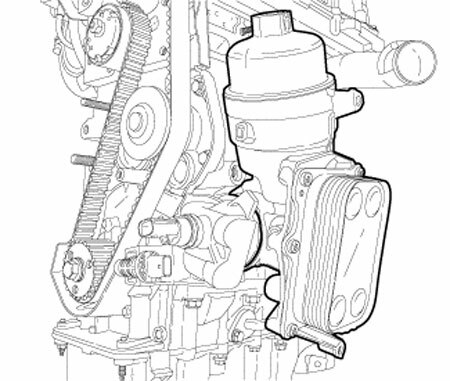 For the external leak you are seeing, suspect the oil filter housing and oil cooler. Last edited by alpinegreenneon; 04-14-2019 at 01:49 PM. Two Issues! Thus two questions! Two recalls. Two clicks closer to perfect bliss.